Russian scientists have developed a flying robot specifically designed to work on Arctic research missions. The vehicle can measure the thickness of ice to help icebreakers, as well as detect oil pollution. The robot was constructed in the Admiral G.I. Nevelskoy Maritime State University in Vladivostok. At least 5 million rubles ($92,000) were spent on the project. “[We are] testing a new unique unmanned aerial vehicle, which is designed to carry the automatic software package which measures the thickness of ice and hydrocarbon content in seawater,” the university said in a statement. The quadcopter has increased resistance to low temperatures, one of the project developers, Aleksandr Pertsev, told Tass news agency. “It can explore and study ice fields, while flying ahead of a vessel following the Northern Sea Route at a speed of 40 km per hour, " he said. “It can also detect oil pollution, which is especially important in the extraction of hydrocarbons in the Arctic shelf," the scientist said. 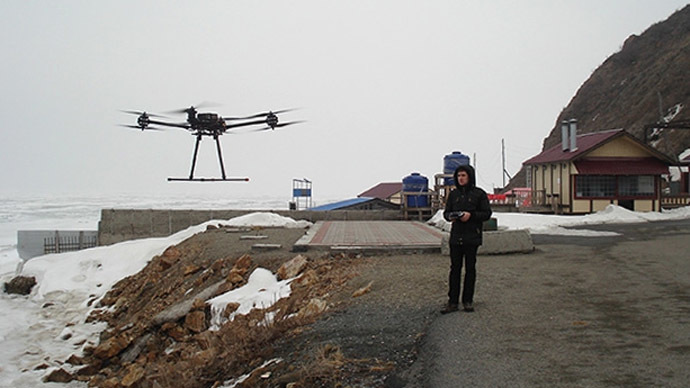 The quadcopter is currently being tested in Vladivostok. Its first real test starts in a few months, when a scientific expedition on the Professor Khlyustin research vessel heads to the seas in the far north. Russia has recently started developing its northern regions, which includes the production of hydrocarbons, with national companies developing the exploration and construction of drilling facilities in the north of the country.